This recipe serves 4, its all plant based and the base is gluten free. This pizza is a tasty way of squeezing those veggies in to meet your 5aday. Ideal for pizza addicts, but healthier, quick and easy to make. Preheat oven to 240 degrees celsius gas mark 9. Using a whisk mix the chickpea flour with the 1L of water, salt, pepper and dried herbs, until there are no lumps and the mixture is a thick, runny consistency. Set aside for 5-10 minutes. Add the mixture onto a greased baking tray and flatten out. Bake in the oven for 10-15 minutes until pizza base is partially set. Meanwhile in food processor blend all the pesto sauce ingredients until smooth. 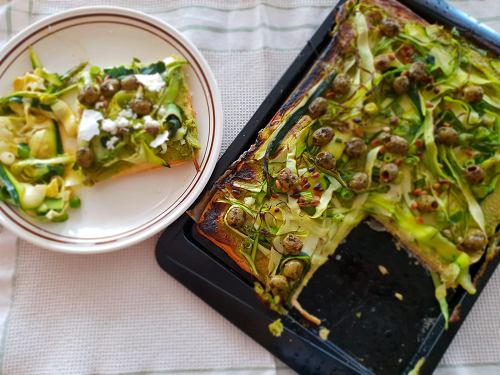 Once pizza base is cooked spread the pesto sauce onto the base and scatter the asparagus, courgettes, spring onions, olives and grill in the oven for 5 minutes ensuring the toppings do not burn.